OMA TOPS OUT MUSÉE NATIONAL DES BEAUX-ARTS Archi-new - Free Dwg file Blocks Cad autocad architecture. Archi-new 3D Dwg - Free Dwg file Blocks Cad autocad architecture. 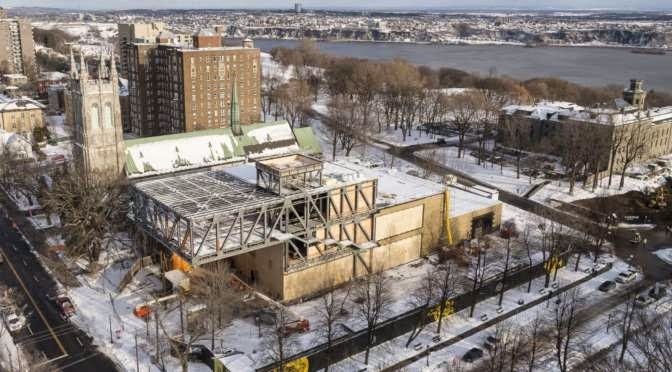 The OMA-designed Musée national des beaux-arts du Québec (MNBAQ) reached its highest point of construction today, with a steel truss system framing the museum’s three stacked galleries. The project marks OMA’s first project in Canada, extending from Quebec’s Parc des Champs-de-Bataille to the Grande-allée. While it creates a dramatic new presence for the museum along this main thoroughfare, its approach to its neighbours and the existing museum is one of respect, even stealth. Seeking to reveal rather than overwhelm, it’s full height allows the adjacent St. Dominique church tower to continue to serve, as it always has, as an icon for both the park and the MNBAQ. Partner-in-Charge Shohei Shigematsu noted: “Beyond a museum extension, our ambition was to provide an extension to the city and the park. Like the topography of the hills beyond, the gallery boxes and the inhabitable roof form a landslide that extends the museum to the park. The galleries float above the Grand Hall that will serve as an urban plaza for the museum’s public functions.” Along its straight side, a circulation spine features orchestrated views between the galleries and to the park beyond. Together with a large elevator within the Grand Hall, a spiral staircase and cantilevering exterior stair create a number of potential routes through the museum. A cascade starting from the highest volume through each of the permanent gallery levels, the temporary gallery and then on to the Pavilion Charles-Baillairge; a rising trajectory that begins with the temporary galleries and culminates in a view from the highest volume out over the city; or a direct route to the rest of the museum complex. OMA New York won the design competition for the Musée national des beaux-arts du Québec in 2010. The project began construction in September 2013 and is expected to open to the public in early 2016. Source by OMA.